Former top-flight referee Paul Alcock has died at the age of 64, the Premier League has announced. 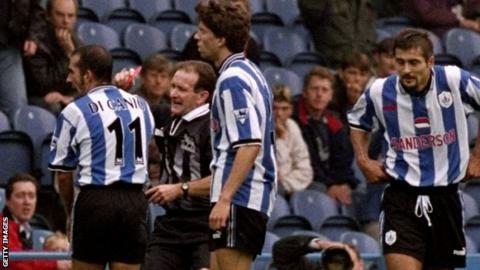 Alcock was famously pushed over by ex-Sheffield Wednesday striker Paolo di Canio after he had sent the Italian off during a league match in 1998. He took charge of 94 Premier League matches between 1995 and 2000. "We knew that Paul had been ill for some time, but we are extremely saddened to hear of his passing," said referees' chief Mike Riley. "Paul enjoyed a distinguished career as a professional referee at the top level and was hugely respected by all involved in the game. "More recently, Paul had been helping to develop the next generation of match officials as an observer, mentoring them during games. "He will be sorely missed and our thoughts are with his family and friends."